Red-billed Queleas are the most numerous land birds on the planet and a large number of predators have been listed for this species. In this paper the author provides the first detailed observations of bird hunting by Pallid Harriers on the African winter grounds and the Red-billed Quelea features high as a prey item. The study was conducted in the Waza-Logone region in north Cameroon, between October 2006 and April 2010. (1) "Fast contour flight". This was a surprise attack on a variety of birds including Red-billed Quelea and Ploceus species. Red-billed Queleas were often chased by the harrier through clumps of bushes and trees; quelea were observed to be caught in three cases. (2) "Overt approach with rapid acceleration". This strategy was observed on the floodplains where the harriers hunted Red-billed Queleas and other seedeaters that congregated in large numbers at the end of the dry season. Two to five Pallid Harriers were observed following a quelea flock simultaneously. Four successful attempts were directed at queleas. (3) "Covert ambush". This strategy was observed by the author at three (out of 10-15) waterholes. Once, a Red-billed Quelea fell into the water after being pursued by a Pallid Harrier - the harrier then caught the bird in the water. 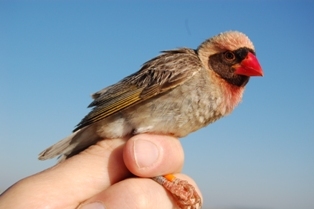 Red-billed Queleas were caught in 13 out of a total of 67 attacks. Other prey caught using this strategy included Ploceus species (2), and other birds. (4) "Stoop from flight". This strategy was observed only twice on the floodplains. Two Pallid Harriers stooped on a Yellow Wagtail (successful) and a Red-billed Quelea (unsuccessful). Pallid Harrier has previously been recorded to take Jackson's Widowbird.